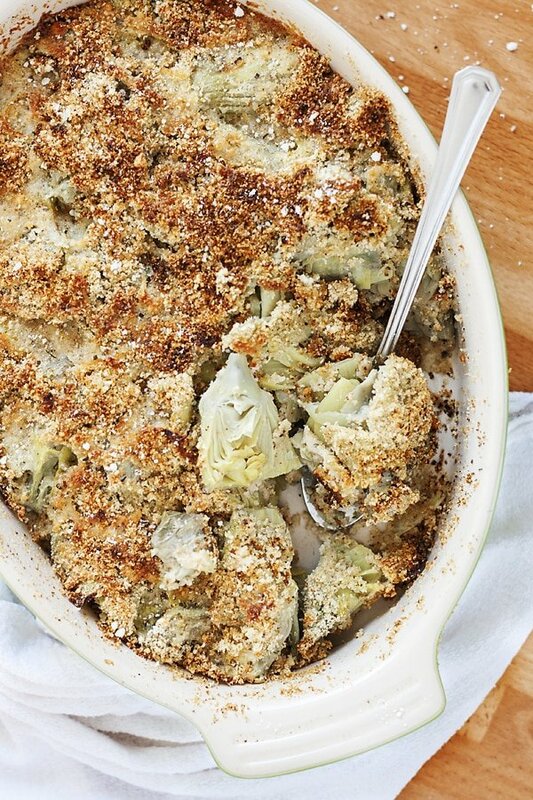 Grandma’s Baked Artichoke Hearts is one of my favorite holiday side dishes. This is such an easy recipe and can even be made ahead of time. It’s a delicious addition to your Thanksgiving or Christmas dinner! My family has some recipes that are mainstays at certain holidays. Without them, it would simply not be the same. Do you have those kind of dishes? We can’t possibly be the only ones, right? So naturally, I had to share one with you. A dish that is a few simple ingredients and quick and easy to throw together. This dish that is an absolute must at every Thanksgiving (and most other big eating holidays as well!). My Grandma Rose’s Roasted Artichoke Hearts. I don’t know the exact origin of this dish, but I suspect it was derived from her (amazing!) Stuffed Artichokes, which were a huge favorite of mine as a kid. From a very early age, I loved the novelty of taking those artichoke petals (Is it petals? Leaves? Why do I not know the correct terminology for this??) and scraping all the delicious artichoke and filling off off them with my teeth. But the real reward was the perfectly tender and flavorful artichoke heart at the center of it all. It’s well-seasoned with cheese, bread crumbs and plenty of the kind of love you can only find in the very best of your Grandma’s cooking. But today, I am so thrilled to share these Baked Artichoke Hearts. They have all the delicious flavor of Rosie’s beloved Stuffed Artichokes with a fraction of the work. And most artichoke heart recipes tend to be a dip of some sort, so it’s nice to have something a little different. Trust me when I say, you’ll want them at every holiday dinner! Be sure to use frozen artichoke hearts. The canned artichoke hearts tend be marinated and it completely changes the flavor of the dish. I boil the artichoke hearts first. Although I don’t generally make a habit of boiling artichokes, I find that the boiling helps get them to the perfect texture. The original recipe is one of those great family recipes that are done entirely by feel! I gave some basic measurements, but I strongly encourage you to do it to taste and to what feels right. The bottom line is, be liberal with the cheese and breadcrumbs (and did I mention the cheese?!). Since this type of cheese is particularly salty, it’s used in place of salt. 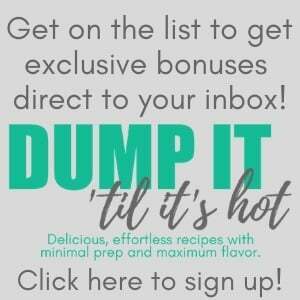 You don’t want to skimp on it! I use the back of a wooden spoon to poke the holes into the artichoke mixture before pouring in the water. You can also use a clean finger, just don’t skip this step. I finish it off with a drizzle of olive oil to help it brown a bit on the top. In a pinch you could always use olive oil cooking spray. Can I make these in advance? Yes! You have two options you can assemble it before and then bake it off just before serving. Or you can assemble and bake and then reheat before serving. How long do you boil the artichoke hearts? I usually do a quick 3-5 minute boil and then drain them well. How long do you bake the artichoke hearts? 30-40 minutes until they’re golden brown on top. How long do these last in the refrigerator? These will last 4-5 days in an airtight container. Can you freeze this? This is not the ideal dish to freeze. How many people does this recipe feed? As written, this particular recipe feeds around 6-8 people. That said, this recipe is pretty adaptable for whatever amount of people you’ll be serving. 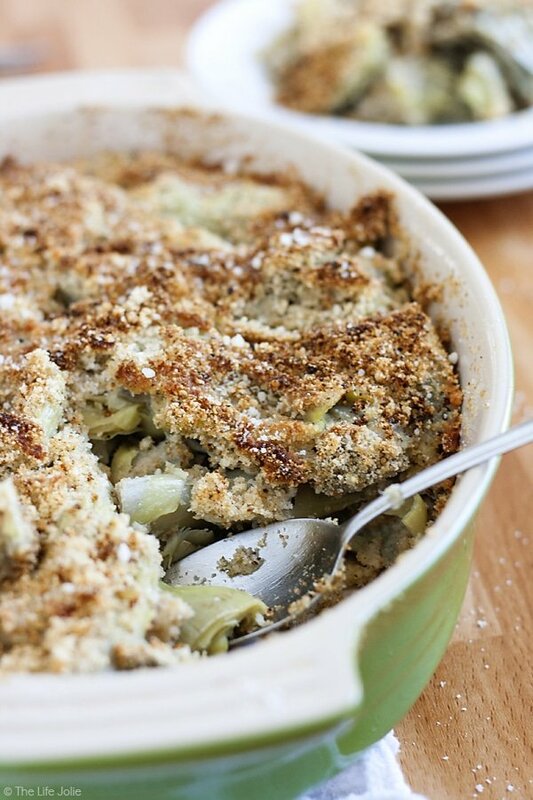 Grandma's Baked Artichoke Hearts is one of my favorite holiday side dishes. 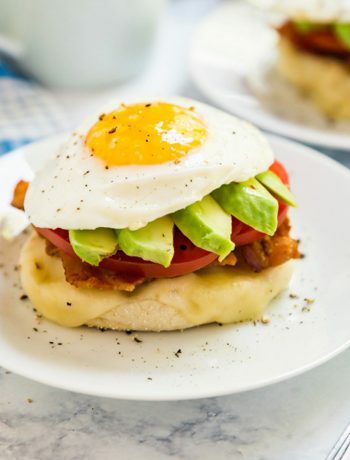 This is such an easy recipe and can even be made ahead of time. This is made with Parmesan cheese, bread crumbs and garlic powder and is a delicious addition to your Thanksgiving or Christmas dinner! Preheat oven to 350 degrees and grease an 8" x 8" or 9" x 9" baking pan. Boil artichoke hearts for 3-5 minutes, then drain well and pat dry with paper towels. 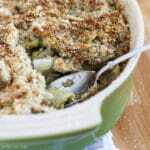 Combine bread crumbs, cheese and garlic powder in a bowl and divide into two equal amounts and set aside. 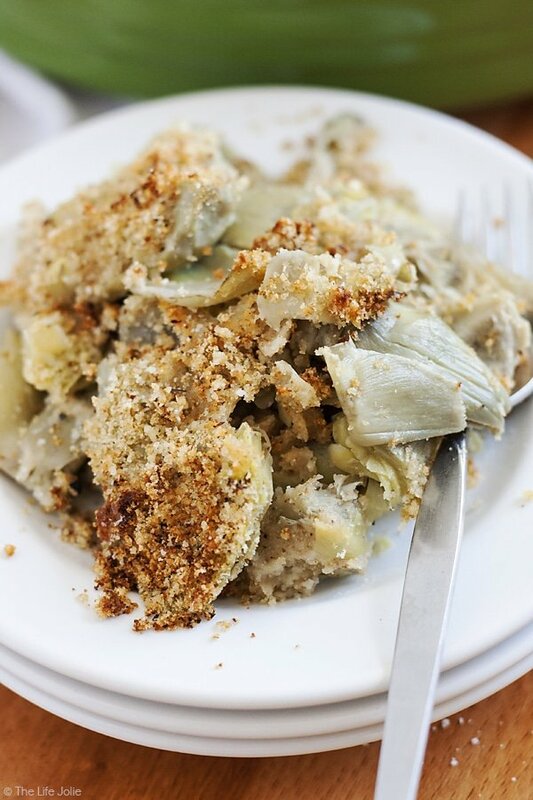 Take half of the artichokes and arrange tightly in a single layer in the bottom of the pan. Use the back of a spoon (or clean fingers) to poke holes all around the top. Drizzle with water- you don't want it drenched and floating in water but you don't want it to be dry either. Drizzle lightly with olive oil to taste (don't drown it) and bake for 30-40 minutes until the top is golden brown. Serve immediately. Looking for some other great pasta recipes? November 8, 2016 at 10:39 am I'm also a huge fan of artichokes- I hope you love them! November 7, 2016 at 7:52 pm Grandma's recipes are always special aren't they? My grandmother makes the best scones I have ever eaten, and don't even get me started on her pea and ham soup! 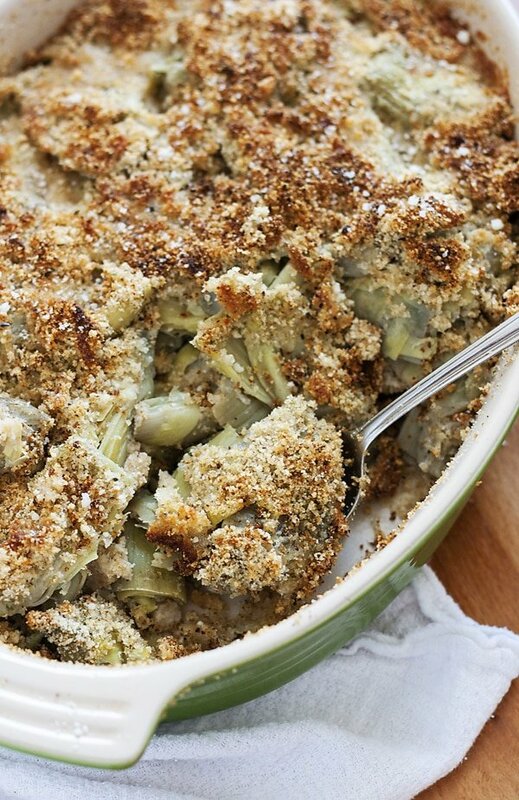 But seriously, these baked artichokes sound amazing. My last experience with artichokes didn't go down so well (I totally overcooked them.. eep!) so keen to give it another try. And how could anything go wrong with a little bread crumbs and cheese?! November 8, 2016 at 10:38 am Yes, they really are! Yum, I would kill for a good scones recipes (neither of my Grandma's made those!). I'm sorry to hear that your last attempt didn't go well. I've definitely had my fair share of artichoke fails, but I finally got it right and haven't looked back :) The big thing with these is to be liberal with the cheese! November 8, 2016 at 10:32 am Thank you, Elizabeth! I never thought of it as exotic haha. The city we live in has a really large Italian-American population, so i's pretty commonplace to walk into most restaurants and see at least one artichoke dish on the menu. November 8, 2016 at 3:36 pm Me too- it's not Thanksgiving without them! November 20, 2016 at 3:55 pm How much olive oil is used & when do you add it? Thanks! Can't wait to try it! November 20, 2016 at 8:51 pm Sorry about that- it looks like I missed that last part but I just updated the recipe. You just drizzle a small amount right before it goes into the oven. It's to taste but it's really just a light drizzle to help brown the top. Enjoy! November 9, 2017 at 5:45 pm This looks great!! November 10, 2017 at 8:39 am Thanks Jocelyn! November 22, 2017 at 6:25 pm I plan on baking them the night before Thanksgiving. How should I reheat them before the actual dinner? November 22, 2017 at 9:40 pm Hi Julie- they’re best hot so I’d say reheat before eating. I’m actually making this to bring tomorrow as well- I’m assembling it all up until adding the water and oil. I plan to do that tomorrow and then bake it off right before leaving. Enjoy and be liberal with the cheese 😊 happy thanksgiving!! December 13, 2017 at 1:42 pm If I double this recipe what size pan would you use? December 13, 2017 at 10:32 pm Hi Jessica- a 9x13 pan should work well for that- if there's overflow you can always do an additional small pan alongside it. I did this exact thing at Thanksgiving and it fit perfectly. Enjoy! 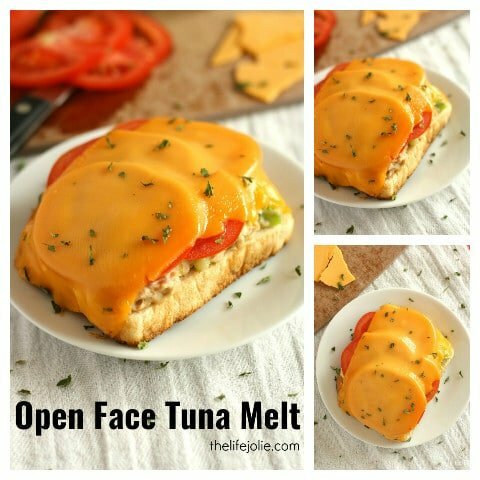 March 25, 2018 at 1:45 pm Great recipe! Definitly one of my go to recipes now. Thanks for sharing! March 26, 2018 at 11:46 am Thanks Nicole- I'm so glad you love it! 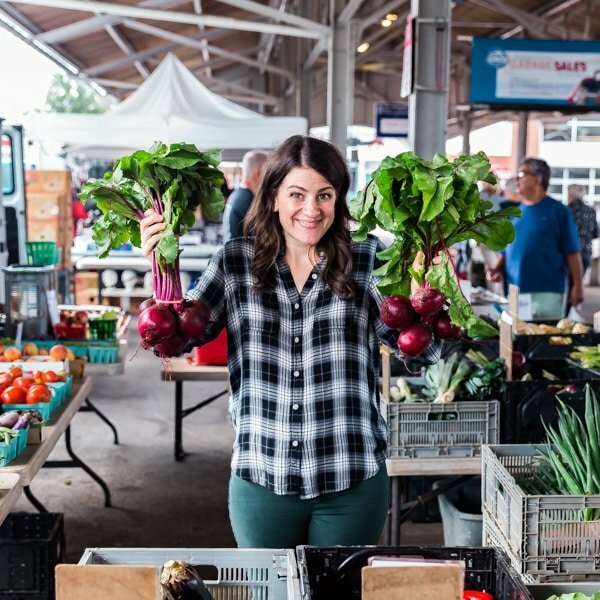 November 14, 2018 at 4:59 pm Thank you for sharing all of these, I spent 2 hours downloading the recipes from you, all these years Ive been doing some of the little things wrong, Grandma would kill me if she knew. 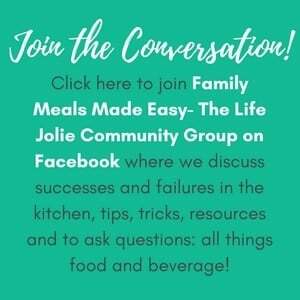 November 19, 2018 at 10:23 pm Enjoy! November 20, 2018 at 5:16 pm Hi! I plan on making this for Thursday. About how much water should I add? Like halfway up the dish or is there a certain amount cup wise you generally add? Thanks! Can't wait to try this! November 20, 2018 at 6:59 pm Hi- I'm glad to hear it- it's a special part of our holiday <3 We've never measured the amount (to be honest, the only reason I used a measuring cup in the video is because it's easier to get an even pour than using one of my glass bowls). I'd say just drizzle a little bit on it. The idea is to moisten it without it being watery. I hope I did a good job of communicating that. December 22, 2018 at 10:04 am Hi Courtney- They have them at Trader Joe's. I usually get them at Wegmans. I will say, they always blend in really well in the freezer section.